"It has been a privilege and a pleasure to work with my good friends at Saddleback Memorial and to be able to further the cause of good health and good medical care in our community." 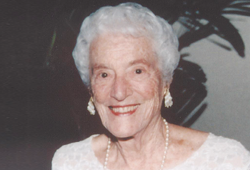 Jessie Dolezal, Laguna Woods Village resident and Saddleback Memorial Medical Center supporter, and her late husband Frank started their affiliation with the medical center in 1988. In addition to being a long-time donor, Jessie has been an active volunteer with Saddleback Memorial fundraising support groups such as the Heart Institute, Circle of Life (hospice) and The Associates. In 1993 Jessie and Frank established their first charitable gift annuity with Saddleback Memorial Foundation and eventually added two more. The annuities prove to be a good source of quarterly income and are designed so that, upon Jessie's passing, the principal will go to Saddleback Memorial to, in Jessie's words, "Help ensure that the hospital continues its fine work and services to our community." Charitable gift annuities offered by Saddleback Memorial Foundation provide a number of benefits that include secure, fixed lifetime payments at attractive rates, tax savings and the personal satisfaction of leaving a charitable legacy for future generations.